Dr Caley presented the school with a gift from the Headteacher and staff of Mlozi school, Malawi. 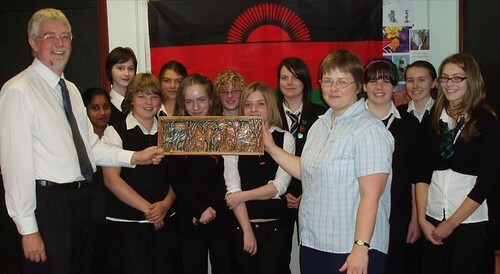 Many of our pupils are currently involved in developing links with the school in Malawi as well as creating a display for the Library that will include the unique wood carving shown in the photo. School Prospectus Online – mostly! Normally the school prospectus is presented to new parents but it is an expensive document to prepare and changes quickly as the year progresses. Ideally we would like all parents to have access to up to date information so we have decided to look at presenting the information via the website. Most of the text in the prospectus is in place but we plan to supplement the pages with some photographs and additional information in the future. Links are available on the right hands side of the screen but iit is available directly by clicking here. We have uploaded the first video clip of school activities onto the school website. This inter-house indoor rowing competition took place in the gym hall before the summer. We will be repeating the event on the afternoon of the 3rd October! Last Friday at a school assembly, pupils were shown a short presentation about the impact the Shoebox Appeal has on those less fortunate than ourselves. Each pupil has been given a leaflet explaining exactly what needs to be done to fill a shoebox and the items allowed. Blythswood will pick up these boxes on Monday 3rd November, so there is plenty of time to make this a really successful appeal once again. Please support this annual collection. During the summer many pupils now in S3 and S4 received certificates from SQA. These certificates are complex in layout but indicate that pupils have achieved a number of core skills in ICT. These are awarded at Intermediate 2 – equivalent to Credit Level Standard Grade. Pupils in Gairloch High generally achieve this level of work as part of the Music and Computing courses delivered in S2. All S4 pupils begin the week commencing Monday 6th October. A lot of work has been done in PSHE to prepare pupils for this experience. Parental support is vital, but if you have any concerns, please contact Mr. Milner or Mrs. Flora Mackenzie. Return any paper work relating to Work Experience as soon as you can. You may have already read Calum’s letter to the Gairloch Times in the last edition. He has been successful in gaining a place to go overseas for a year with Project Trust in August 2009. At present he is being considered for a project in China, Japan or Malaysia. Calum now has to raise over £4000 to pay for this wonderful experience. He is busy preparing flyers and letters to send out to anyone who might be willing to sponsor him. Good luck Calum! Last issue Conal McDonagh’s success in being selected for the newly formed Highland Youth Pipe Band was mentioned. We have now had confirmation that Sophie Donald is again invited to participate in the Highland Youth String Orchestra. Well done Sophie! Four pupils received Achievement Awards from the Trekking and Pony Society of Scotland recently at Blair Atholl. Kim and Jade Watson along with Amanda McSharry received Level 3 awards and Camilla Hill, Level 4. Well done girls! Dan Fox joined recent leavers Liam Ross, Sam Mackenzie and Neil Macleod on a four day kayaking expedition for the Gold Duke of Edinburgh’s award. The group paddled down Loch Shiel from Glenfinnan out to the sea, passing Castle Tioram on their way to Arisaig. The weather was kind and the midges were on their last legs. Highlights were the splendid campsite on Eilean Shuna and the exposed crossing of Loch nan Uamh to round the Rhu Arisaig headland. This was a real adventure that tested organisation, resilience and physical strength. Congratulations to the boys on their efforts. We look forward to sending off completed Gold award books in the near future. Many thanks to Mrs Johnston for organising the daunting paperwork necessary for the trip to take place and to Emma Pearce, the expedition assessor. Click here for a map of the area visited and here for photos of the trip. Jamie Shearer has just completed a 3-year course in marine Engineering at Warsash Maritime Academy, Southampton. BP Shipping sponsored Jamie during his training period, which combined periods at Warsash with practical training during periods at sea. The BP fleet consists of tankers and liquid natural gas carriers. Whereas most of the tankers have diesel engines, the gas carriers have dual fuel steam turbines and Jamie has qualified in both steam and diesel. Jamie has won an award for the ‘Best Engineering Portfolio’. This award is made by the Marine Society, and will be presented to Jamie at their annual meeting, in London, in October. Jamie is returning to Warsash for a further 10-week course to gain a qualification as an electro-technical officer and will resume his sea duties just prior to Christmas. During his training Jamie has docked at Australia, New Zealand, Japan, Papua New Guinea, Singapore, Persian Gulf,Kenya, Spain, USA, South Africa, Trinidad and the Dutch Antilles. Aberdeen University has informed us that Chloe Ross has achieved First Class Honours with a Master of Arts Degree in History and International Relations. S2 have participated in the campaign to end child poverty in the UK. As part of the activities they learned more about how the economy works, how poverty affects children’s lives and what can be done to eradicate child poverty in the UK. The pupils joined in a quiz and wrote their own messages on a large block, which is one of thirty distributed around schools in the UK. These blocks will be presented to the Scottish Parliament in September and will then travel on to Westminster Parliament where they will be on display in October. Photos of 2A and 2B with their blocks and messages can be seen here on the school website. Mr Caddell and Mr Johnston accompanied 15 pupils to Glasgow University Open Day on 9th/10th September. Everyone appeared to have come back from this trip well informed, with all pupils gleaning valuable information and a better understanding about University Life. A link has been posted on the website to www.enquire.org.uk This site supplies information about additional support for learning. The Parent Council met on Monday 15th September in the High School. Draft minutes are available by clicking here. The Council is keen for more parents to become involved. Particularly in the fundraising events that will take place over the coming session. The main objective of this is to reduce the overall cost of the French Trip to all pupils. Parent Council still hope that more pupils will be able to attend this major event next summer. Elections also took place to confirm positions for the coming year on the Council. Classes resumed on the 19th August. We welcome Ms Colquhoun, who replaces Mr Richardson teaching History, and Mrs Bulmer who is currently taking on the work of Mrs MacDonald in the Support for Learning Department. Congratulations also to Mrs Whall, neé Morrison, who got married to Brian during the holidays. As you will be aware from the last edition of the G&D Times, Dr Caley had a successful trip to Malawi. We have been asked by Dr Caley to pass on greetings and best wishes from Mr Chimtali, headteacher, the staff and pupils of Mlozi School, Dedza district, to all members of our school and community. Dr Caley has also brought back a gift for the school. This beautiful wooden carving will be mounted in the school library shortly along with other items for pupils, parents and other members of the commuity to view. Dr Caley has set up a website which contains reports and photos describing her involvement with Malawi. School Assembly for all on the first day back allowed Mr Port to welcome the new S1 pupils to Gairloch High School and congratulate the senior pupils on their exam success. It was an opportunity to stress the importance of being organised and focused, for the work ahead, for all pupils. Mr Port and Mr Hulme reminded senior pupils of the fact that cannot be stressed enough – Highers are much more difficult than Standard Grades and application and hard work are necessary from the very beginning. School planners have been given out to all our pupils and we would encourage parents to check them and so support the children in developing good study habits. Use of the planner is an important link in helping parents see what pupils are being asked to do. All homework should be recorded in the planners. Staff are currently analysing the results attained by S4, S5 and S6 pupils in the recent SQA exams. Several individual performances are worthy of mention. Flora Donald got 5 A passes at Higher last year and has achieved 3 A’s this year in Advanced Higher Biology, German and Geography. Callum Croal got 5 A passes at Higher last year and this year he added 2 A passes in Chemistry and Physics at Advanced Higher to the Advanced Higher Maths A that he achieved in S4. Spencer Hill and Jenny Martin achieved A’s in Advanced Higher Art. Zoey MacIver got an A in Advanced Higher Gaelic (Learners). Andrew Ramsey got an A for Advanced Higher Physics. Emily Ross got and A for Advanced Higher French. A third of the pupils in S6 achieved at least one Advanced Higher in a subject – most of these passed more than one. This is well above average across Scotland and the best performance in Highland. Although S6 is often thought of as a bit less stressful than S5 the pupils clearly put the time to good use! Our Higher and Standard Grade results are much as we expected and on a par with previous years with particular overall success in Art, French, German, Music, Graph Comm, Chemistry and Physics. Some pupils will be happy or may be disatisfied with particular results but overall they have done well. Appeals are currently being processed for pupils in some subjects. Eilidh Alexander and Roxanne Ramsay were presented with their Bronze Duke of Edinburgh’s Award during the first assembly of the new term. Having already acquired the new ‘June Miller Award for Art’ at the end of the last session, Abbie Spence has gone on to achieve further success in the same field. The work that she produced for her Higher Art has been chosen for show in various venues throughout Scotland, including The Scottish Parliament Building. She is one of 250 pupils who have been selected from 35,000 candidates. Well done Abbie – we are all very proud of you! We have also heard that Conal McDonagh has been invited to join the National Youth Development Pipe Band. This means weekend ‘band camps’ in Glasgow and a performance in Glasgow on St Andrews Day. Well done Conal! Congratulations Amy Marshall, Laide, former Gairloch High School pupil, whose graduation photograph appeared in last week’s Journal. Amy graduated from Aberdeen University with a Bachelor of Education (First Class Honours). She will take up her teaching career in Burgh Primary School, Galashiels. We wish her success in her chosen career. Well done, Elaine — A Gairloch girl, who is the captain of the Inverleith ladies hockey team in Edinburgh, had the honour, on behalf of her team, to be presented with a trophy at a presentation dinner and dance in the Hilton Hotel, Dundee, recently. Her team won the Scottish Ladies Hockey Team of the year award. Elaine, who was a star hockey player when a pupil of Gairloch High School, is the daughter of Donnie and Sylvia MacKay, Lonemore, Gairloch. She graduated with a BSc in Nursing Studies in Edinburgh two-and-a-half years ago, and is now a staff nurse in Coronary Care in St John’s Hospital, Livingston. Currently there are about 140 pupils who have paid their deposits for the trip to France next June It is still not too late for any pupil who would like to join this trip. A letter of consent is available from Mr Milner. The second deposit of £55 was due by the end of August. Please make any cheque payable to Gairloch High School, place it in an envelope with your son/ daughters name on the front and hand into the office. S6 pupils Becky and Rebecca are planning to organize a charity event that will put us in the record book and raise funds for a good cause. They are organizing an event that may get us a mention in the Guinness Book of Records. Watch this space for more information. Parents will receive a letter home soon with further information.